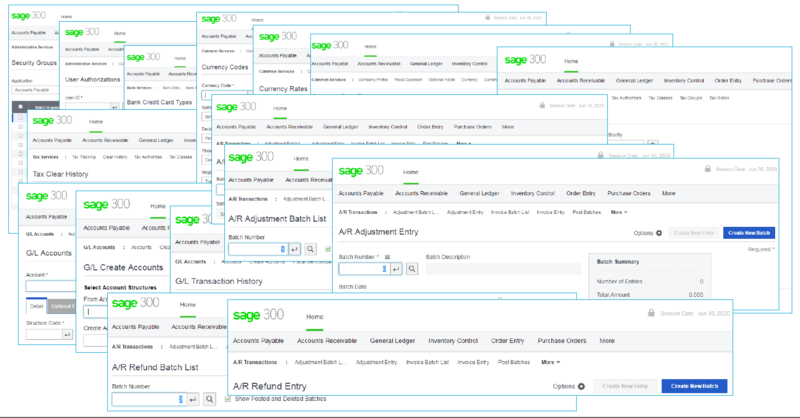 A marquee feature of the Sage 300 2016 release last year was the new web screens that were introduced. With the more recent Sage 300c 2017 release in July of this year, even more web screens were rolled out. Now that they’ve become more prevalent in the software, we thought we’d take a closer look at some frequently-asked questions. What’s the Difference Between Web Screens and the Sage 300 Portal? Web screens are completely redesigned versions of Sage 300 desktop screens that run in a browser and are launched from a new browser-based home page. They are more compatible and easier to use on a wider range of devices than the traditional desktop screens. The Sage 300 Portal provides access to Sage 300 desktop screens from a web browser, but the screens themselves are not web-based. You’re simply accessing desktop screens over the web. Do Web Screens Replace the Sage 300 Portal? Not yet. The portal is still available and required if using the quote-to-order feature in Sage CRM. Are All Sage 300 Desktop Screens Available as Web Screens Too? Not all modules and screens from the Sage 300 Desktop are available as web screens yet. With the 2016 and 2017 releases, Sage began with a selection of screens from frequently used modules like GL, AP, AR, Order Entry and Purchasing. However, more web screens are planned for future product releases. You can get the full list of CURRENT Sage 300 Web Screens here. Can I Use Web Screens and Desktop Screens at the Same Time? Yes. For example, if you’ve customized some of your desktop screens, you can continue to use those while using the web screens for other tasks. Do I Have to Install Sage 300c on Every Computer or Device to Use Web Screens? No. You do not need to install any software. You just need access to a web browser. If you are outside of your network the IP or server hosting web screens needs to be externally available. To get the FULL scoop on web screen features, capabilities, and customization options, go online to the Sage 300 Web Screen FAQs support page for full details. And be sure to Get In Touch if you need help upgrading your Sage 300 software or want to know how to put these new web screens to work for your business.